Congratulations on your engagement! Many of us have done at bit of daydreaming about our wedding day. Some of us may even have the entire day visualized. However, if you are not sure where to start or perhaps you have no ideas on what you will like your day to look like, a great place to start is by defining your wedding style. Your wedding day should be a reflection of both you and your partner, and your journey as a couple. Think through your overall wedding style by indentifying things you love, things that reflect your personalities, and what best describes you as a couple. It is important to draw upon things you love; however, you also want to ensure that there is consistency in what you choose. You will also want to think of things that reflect your personality and how best they can be presented. Every couple has their unique story and your wedding day is a great place to share with friends and family your special journey. Bringing all of the elements together can be a struggle, but with some planning you can have a wedding that reflect your personalities and translate into an event that is beautiful and uniquely representative of you as a couple. When you think through your prior experiences it can help you decide what type of event you will like and the type of experience you will like your guest to have. Perhaps you have experienced a wedding from the perspective of a guest or you have helped a friend or family member with their wedding. Use this experience and think about the weddings you have attended; what are some of the things you remember most fondly? What did you like or dislike about them? What would you have done differently? How will you describe your favourite weddings, casual or elegant? Did you enjoy the music or food? What did you think about the venue? The amazing images available on the Internet can be overwhelming. However, a great way to narrow things down is to focus your attention to what colors, textures and objects you find appealing. At this phase of your planning, just knowing what you like will make all of the difference. You can use sites such as Pinterest to create inspiration board(s). You can share your board(s) with members of your wedding party or with those involved in the planning of your wedding. When meeting with bridal vendors, your inspiration board(s) can also be a very valuable tool to give them an idea of what you envision for your wedding day. 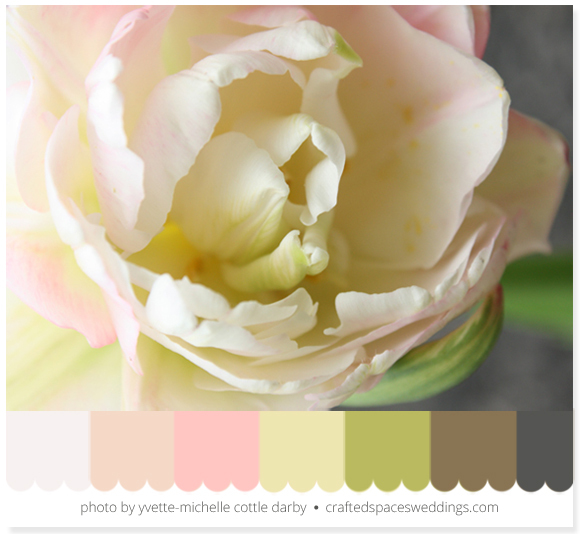 Take a look at the ideas you have collected for your wedding day and come up with a colour palette. I recommend using three to five colours; however, there is no rules on how many colours you can use. This will give you a colour palette to work from when you are selecting your flowers, table linens and other decorative elements. If you are drawn to a very vibrant colour you can offset it by incorporating some neutral tones. If you are having difficulty identifying or narrowing down your colours, I suggest picking three images that you really connect with and sample the colours from them. There are lots of great online tools that will help you generate colour palettes from images. You can also use programs such as Photoshop or Photoshop Elements to create great colour swatches from your favourite images. A wedding style is what describes the look and feel of your wedding. When you start to look at the collection of images and ideas you have gathered, you will begin to recognize a trend in the things you like. This in essence will be you defining your wedding style.